When Indiana takes the floor at Assembly Hall against Minnesota on Thursday evening, the Hoosiers will do so as a top ten team in both the Associated Press and USA Today/ESPN coaches top 25 polls. After a pair of wins over Michigan and Penn State, Indiana jumped five spots in the AP Poll and four spots in the coaches poll. 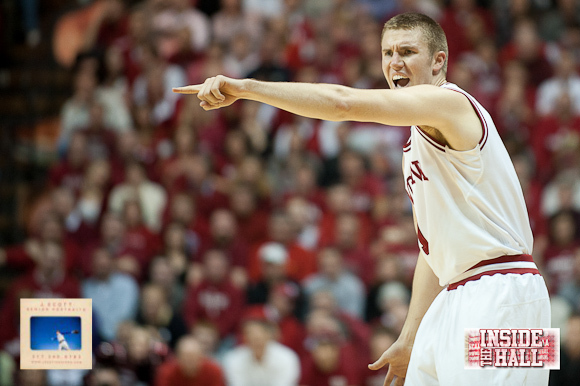 The Hoosiers were last ranked No. 7 in the AP Poll on Jan. 21, 2008 and No. 8 in the coaches poll on that same date. Four Big Ten teams — Ohio State, Michigan State, Indiana and Michigan — are ranked in the top 15 in both polls. You can view the complete AP Poll here and the complete coaches poll here. No, this isn’t the most talented team in the country, but the way it shoots it could beat anyone on the right night. Isn’t Buford done soon? I swear that SOB played with Kelvin Ransey—he’s been there forEVER! This team is better because of the overall character of the kids. They are a true reflection of Coach Crean and what he epitomizes in his life. These are the type of kids we expect to be representing our University and they are doing it proudly. Your Chris Webber reference actually proves his point; making critical mistakes in big games can cost a championship, although Michigan probably would have lost that game even if he hadn’t called timeout. Also, the Fab Five was not a championship team – they won exactly zero Big 10 titles and zero national championships. They are an excellent example of marketing hype over substance. During their two-year run, IU appeared in the final four and won a Big Ten championship, but no one other than us fans remember that. I think it is interesting how so many of us Hoosier fans are in denial. Even after 15-1, with wins over #1 and #2, we still need yet another win to know “without a doubt, how far this team can go.” Man, those tough years have taken a toll on us!! My respectful advice …… sit back and enjoy the ride. This is a very tough Indiana team, capable of beating anybody. One game (win) at a time folks!! VO finally learns the low entry pass with spin and Zeller has a breakout performance. 21 and 12. It only took three years + for Indiana to go from totally devastated to # 7 in the land! A great job by Coach Crean, his entire staff, and each and every player who suited up during the last four years! Job well done! Now let’s stay there, win a B1G Championship, a B1G Tourney, make a Final Four, and do it every year with quality kids. Go IU! You are wrong! Only a fool changes a team that is 15-1, ranked # 7, and has lost only to the # 6 team on the road without our # 5 scorer! There is now no way that IU does not get a # 4 seed or better in the NCAA Tourney. You are right Fad. It’s a bit of a conundrum for us IU fans. It is hard to accept IU being thought of as a great team. We weren’t expecting the greatness to come until next year. I guess I am in denial as well but the +’s sure look to outweigh the -‘s. Beat Minny and win @ OSU or have a chance to win late, and I am all in. I like that name! I’m one too! The turnaround shows in every area, if Dickys excited that says a lot! Because I was in Vietnam I don’t actually remember how many seasons Bobby had prior to 1976….I’m that excited!! !